Home » Who is the Father of Philippine Anthropology? Home » Lifestyle » Who is the Father of Philippine Anthropology? Who is the Father of Philippine Anthropology? Henry Beyer authored the “Wave of Migration Theory. 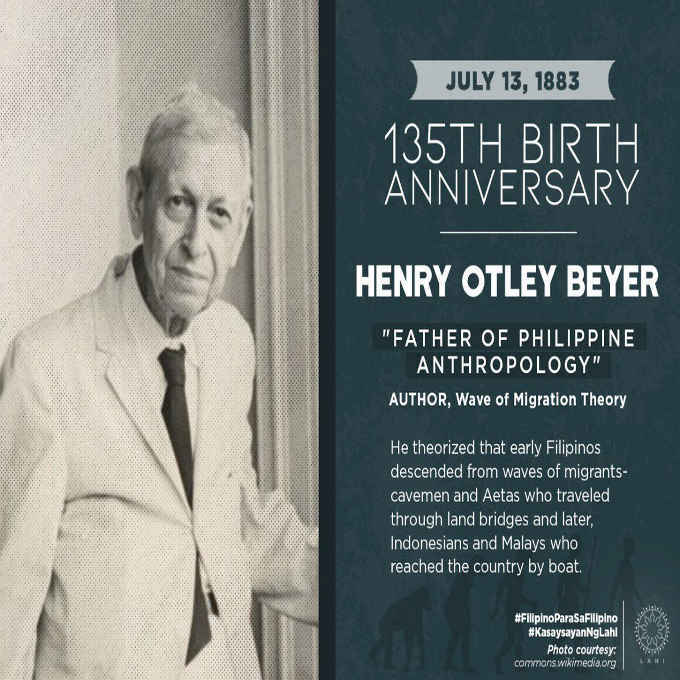 He theorized that early Filipinos descended from waves of migrants-cavemen and aetas who traveled through land bridges and later, Indonesians and Malays who reached the country by boat. Beyer was born in Edgewood, Iowa, on July 13, 1883. He received his B.A. and M.A. degrees from the University of Denver,Colorado and later pursued further graduate studies at Harvard University as a Winthrop scholar. His interest in the Philippines was first kindled after witnessing the fifty-acre Philippine exhibition at the Saint Louis Exposition of 1904. To fulfill his dream of going to the Philippines, he took a job with the Ethnological Survey Office, Philippine Civil Service, in July 1905. Beyer was honored by several Philippine institutions. He was awarded honorary doctorates by Silliman, Ateneo de Manila, and the University of the Philippines. Before his death in 1966, three prestigious universities published commemoration volumes as a tribute to his dedication namely, San Carlos University in Cebu City, Ateneo de Manila, and the University of the Philippines, in cooperation with the National Museum of the Philippines, the National Science Development Board, and the National Research Council of the Philippines. One of Beyer’s most distinguished Filipino students is Dr. Carlos P. Romulo, a former Philippine Secretary of Foreign Affairs, who in 1949 was elected the first Asian President of the United Nations General Assembly.